The Generated Drawing Views functionality allows to automatically generate associative orthographic and standard isometric views of a 3D solid model. All drawing views are placed in a paper space layout, they are not visible in model space. 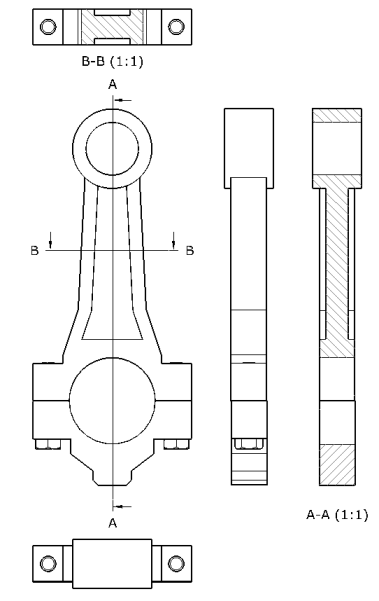 Analytical hidden line removal (HLR) procedures are used to create the drawing views using standard 2D entities, mostly lines and arcs. Much like the result of the FlatShotcommand. Drawing views created in V14.1 will be automatically converted into HLR geometry by the ViewUpdate command. The ViewBase command generates associative orthographic and standard isometric views of a 3D solid model in a paper space layout. The ViewSection command creates a cross section view based on a standard drawing view generated by the ViewBase command in a paper space layout. The ViewSectionStyle command allows to modify the appearance of the section views created by the ViewSection command. The ViewProj command generates additional projected views from an existing generated drawing view. The ViewDetail command creates a detail view of a portion of a standard generated drawing, at a larger scale. The ViewdetailStyle command allows to modify the appearance of the detail views created by the ViewDetail command. 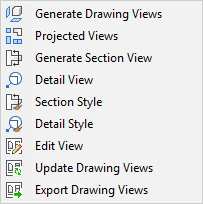 The ViewUpdate command Updates a selection of drawing views obtained by ViewBase and ViewSection when VIEWUPDATEAUTO = 0. The ViewExport command exports the content of drawing views obtained by ViewBase and ViewSection to the Model Space of the drawing. This command can be used in paper space only. The ViewEdit command allows changing the scale and the hidden line visibility of drawing views. Drawing views generated in V14.2 or higher will show correctly in BricsCAD V13. The most recent V13.2 version is recommended. Drawing views generated in V14.2 or higher do not display in V12 and older BricsCAD versions. The Drawing Views panel of the Annotate Ribbon tab. Standard views include multiview orthographic and isometric projections. 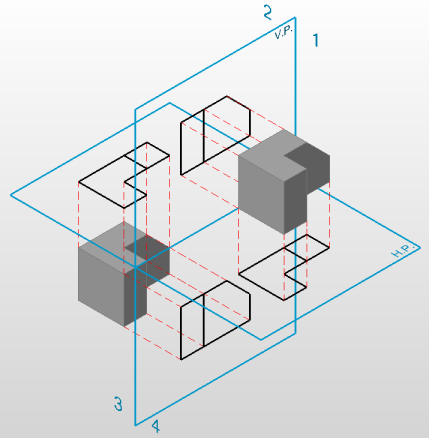 In a technical drawing, a multiview orthographic projection is an illustration technique in which up to six images of an object are generated, with each projection plane parallel to one of the coordinate axes of the object. Isometric projection is a method represent three-dimensional objects in two dimensions in technical and engineering drawings. It is an axonometric projection in which the three coordinate axes appear equally foreshortened and the angles between any two of them are 120 degrees. To generate the standard views of your 3D solid model, run the ViewBase command from model space. 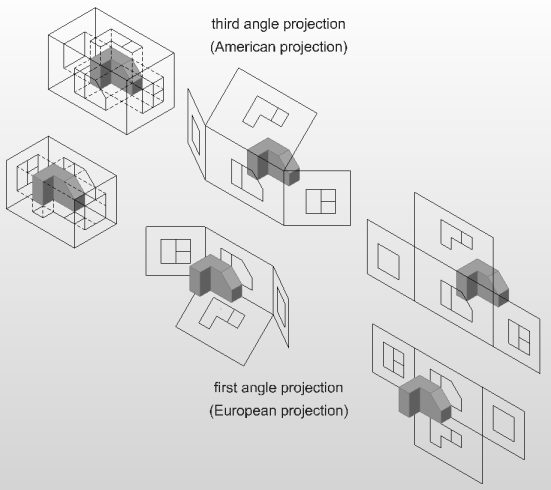 You can choose between first angle (European) projection or third angle (American) projection. Orthographic projection (or orthogonal projection) is a means of representing a three-dimensional object in two dimensions. It is a parallel projection, where all the projection lines are orthogonal to the projection plane, resulting in every plane of the scene appearing in affine transformation on the viewing surface. 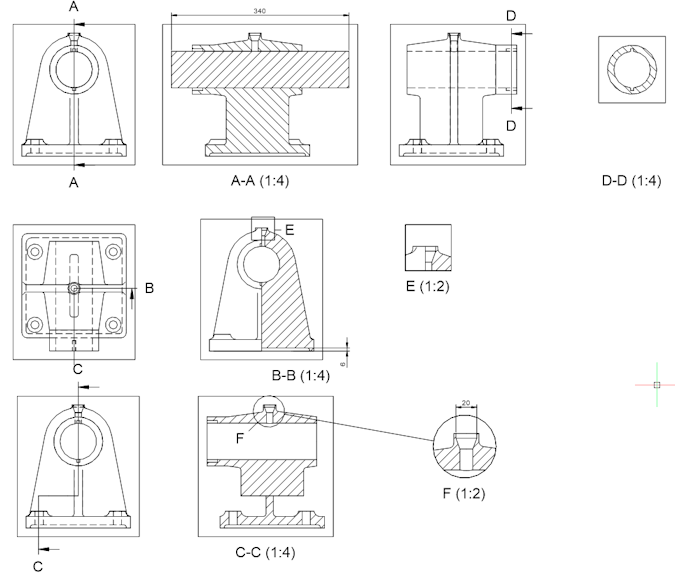 It is further divided into multiview orthographic projections and axonometric projections. Two projection planes, one horizontal (H.P.) and one vertical (V.P.) divide the space in four quarters. In the first angle projection system the model is placed in the first quarter space (first angle). In the third angle projection system the model is placed in the third quarter (third angle). With multiview orthographic projections, up to six pictures of a 3D model are produced, with each projection plane parallel to one of the coordinate axes of the model. The views are positioned relative to each other according to either of two schemes: first-angle or third-angle projection. In each, the appearances of views may be thought of as being projected onto planes that form a 6-sided box around the model. The value of the PROJECTIONTYPE system variable is saved in the drawing. The display of the BM_Isometric_Hidden layer is turned off by default. Additional projected views can be added using the ViewProj command. A projected view inherits the scale, display settings and alignment from the parent view. A cross section is the intersection of a 3D solid model with a section plane. In technical drawings, the internal parts of the 3D model are hatched in cross sections. To generate section views of a 3D solid model, run the ViewSection command from the paper space layout where the standard drawing views exist. opening a paper space layout containing out-of-date views if the VIEWUPDATEAUTO system variable is ON. running the BmUpdate command (BricsCAD Platinum only). Hidden line removal calculation might take some time for complex 3D models. In such cases it is recommended to set VIEWUPDATEAUTO = OFF. The viewport border of out-of-date drawing views turns red to indicate an update is needed. When executing the ViewUpdate command, BricsCAD prompts you to either select the drawing views to be updated or update all drawing views. If GENERATEASSOCVIEWS = ON, associative dimensions will be updated according to the modified 3D geometry. Use the ViewEdit command to change the visibility of these layers for all view or for selection of views only. Edit the properties of these layers, such as linetype, lineweight or color, to modify the display of the drawing views.